Over the past two days India has been suffering from widespread strikes affecting transport in its major cities, however so far ports and airports have not been directly affected. This is despite participation of the dockworker’s union in the action. Led by the ‘Centre of Indian Trade Unions’ (CTU) group of trade unions, the strikers are protesting at reforms being implemented by the government of PM Narendra Modi. In particular they are concerned about the impact of changes to employment law in the ‘unregulated’ road freight and passenger transport sector which have failed to address trade union member’s concerns about job security. They are also pressing for a minimum monthly wage for transport workers of INR24,000 ($340). Despite both truck drivers and port workers taking part in the strike, the direct impact on logistics infrastructure seems to have been modest. The Port of Kochin is said to have been disrupted, however this appears to have been more due to protests outside the port than staff failing to turn up for work. Rail operations were interrupted in several parts of the country, including most of the major cities but not halted. Again, the disruption was largely due to protestors blocking rail lines. There are reports of difficulties in sourcing road freight but bearing in mind the diffuse nature of this sector it is hard to measure the level of this. Postal services have been temporarily stopped by industrial action by employees. The most noticeable effect has been on passenger transport where bus services as well as taxi services have been withdrawn and this appears to have brought some of India’s largest cities to a temporary halt. 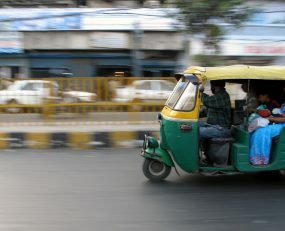 India has experienced rapid growth over the past decade. Although incomes have been generally rising, levels of unemployment are still high and this has depressed growth in wages in lower skilled employment sectors including areas of transport. Friction in the labour market has been exacerbated by continued attempts by the government to deregulate what is still a highly regulated economy. Consequently, strikes are hardly surprising.